According to MotorTrend’s Peter Lyon the NSX will be back, just not as we imagined. 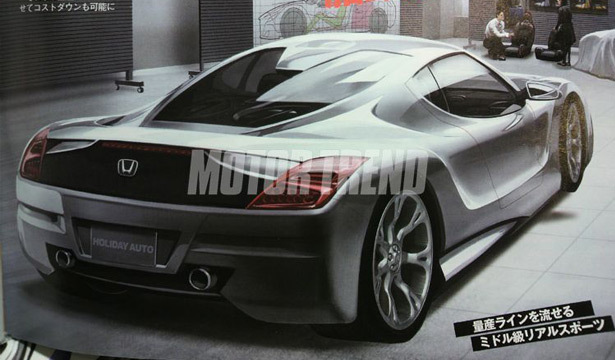 The images look like a scans from Japanese Magazine “Holiday Auto” and is obviously nothing like the front mid-engine Honda HSV-010 GT currently racing in the Super GT. The front looks like an R8. Not like honda style at all. And the back looks like a Carrera GT. I like the HSV GT more. @Buddy, the front actually looks like the CR-Z. This is not a real render anyway. Japanese magazines obviously has a deep pool of awesome graphics designers on tap any given time. I’ve followed these Japanese magazines scans for 5 years, none actually unveils anything. If anything, these magazines heard a rumor from somebody who knew a guy who knew a guy who works for about a new product in the works. 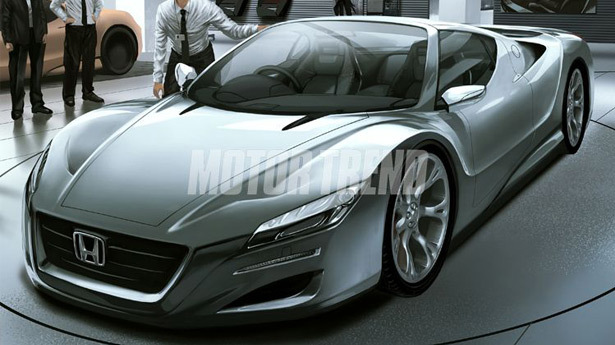 Honda Beat revival, S2000 revival, production Sports 4 concept (which turns out to be Accord Euro/TSX), the list are endless. This is probably just another one shot render to sell the magazines through sensational news. Yeah I guess it looks like a wider CRZ but the whole front still looks like an R8 to me. Not a bad looking car, just not somthing I would think Honda would do. Acura Enthusiasts will be more happy after seeing the NSX back on to the roads.